Garmin - Microphone Hanger for GHS 20 Use the included mounting hardware to mount the microphone hanger in a convenient location close to the radio. 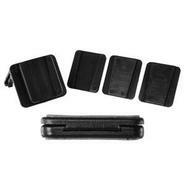 Garmin - Belt Clip for GLO Keep your GLO in reach while on the move with this durable belt clip. Simple snap your compact unit securely into the plastic mount and clamp it to your belt or clothes and keep it near while you navigate on foot. Garmin - Bail Mount Single Knob We've heard it more than once... the knob for your mounting bracket jumped ship. No need to get a whole new mounting bracket when this little knob's all you need.